I have a Greek text with some English words and I want to filter the lines which begin with capital letter, how would I do that? with Match Case and Use Regular Expressions checked. 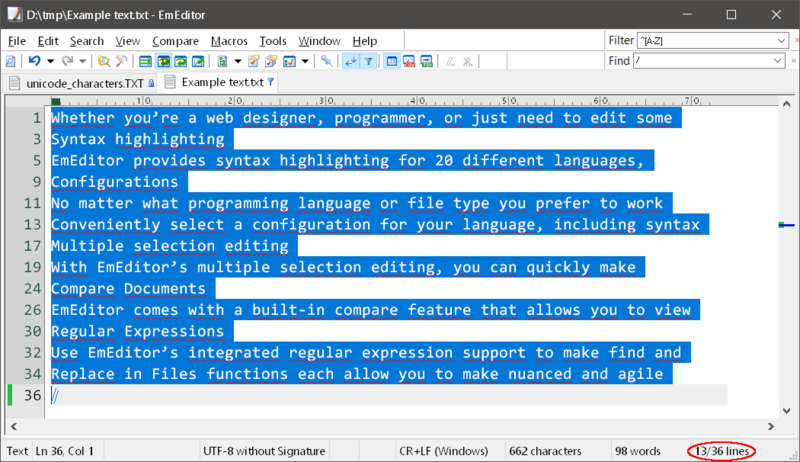 but if I select Regex in the filter the \n bit does not work. followed by any character (except newlines) . Is there a way to show the number of lines filtered? 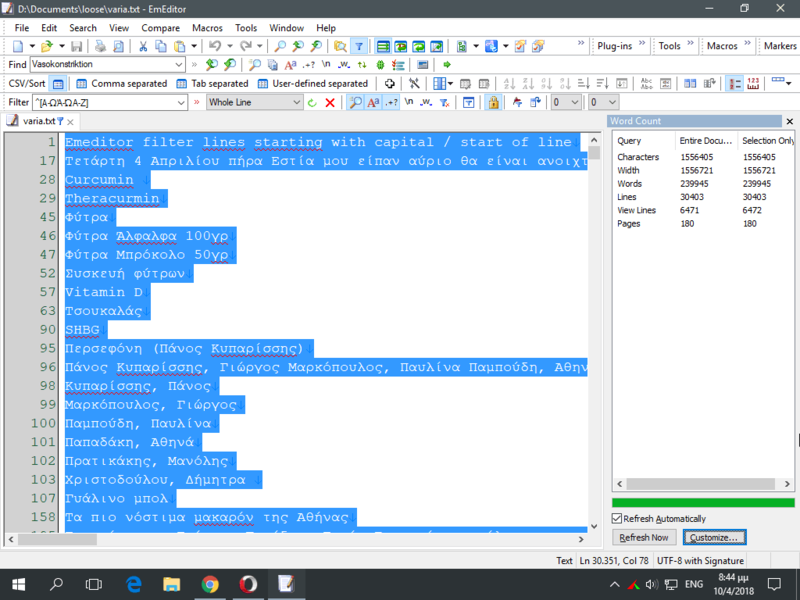 Word count shows the total number of “Lines” and the “View Lines”, with the View Lines corresponding to the number of filtered lines. The status bar in the bottom right corner will then show the number of selected lines. Hit ctrl+a to select all lines, then the bottom right indicator shows the number of selected lines and the total number of lines. Option 2 is fast in my case. There is one downside that Option 2 does add the last line to the count if it is blank. Yes, sadly sluggish performance is the case for large files. I am working with a 500.000 lines file and Option 2 apparently works (in my case does not work at all, see screen) if “Word Count” plugin is active, which means… very slow performance. It was dead slow even with a 30.000 lines file. Can you please clarify this sentence? I’ve now noticed, that word count does the same thing but the other way round. I fixed the issue with the number of selected lines incorrectly displayed in the status bar and the Word Count plug-in. I also optimized the Word Count plug-in for speed, but if you need to speed up the plug-in, you might want to remove unnecessary queries such as Widths. Also, queries using regular expressions can take much longer time than others, so should be removed if unnecessary.